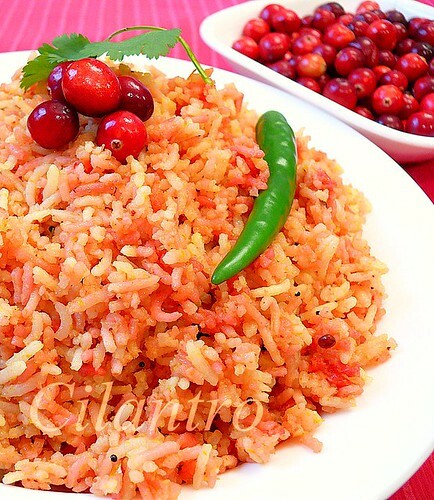 Cranberry rice is a delectable combination of cranberry and green chilli paste mixed with rice in a light seasoning. A very simple recipe with a great taste and a healthy alternative to the traditional lemon rice. Cranberries are a source of polyphenol phytochemicals under active research for possible benefits to the cardiovascular system, immune system and as anti-cancer agents. I have used cranberries in a variety of Indian recipes with great success and Cranberry Rice is one such winner. Grind the cranberries with green chillies to a fine paste. Keep aside. Heat 2 tablespoon of oil in a kadai/pan. Add the cranberry paste, turmeric, salt and saute for about 3 to 4 minutes. Add the cranberry masala to the rice. Heat 1 tablespoon of oil in a kadai/pan. Add the mustard and when it splutters, add 1/2 teaspoon ullutham paruppu, asafoetida and curry leaves. Add to the rice and mix gently so as not to break the rice. Tips: Cashews are optional. Roasted peanuts can be used instead. I have used basmati rice. Use Cranberries with nice red color which indicates they are fully ripe and they get tart only when ripe. Adjust green chillies according to your spice levels. Cilantro, that is an attractive looking rice and I am sure tangy and tasty. I see these beauties at the store and not many recipes. Should give this a try for sure. Wow really clever to make rice with cranberroes. Thanks Indo, Nandhini and Happycook. I was always attracted towards these red beauties and gave it a try and it turned out to be too good. Do try and let me know. Wonderful recipe Cilantro!!!. Great idea to make rice with them. Looks easy for a bachelor like me. I'd like to invite you to take some time to drop by at Foodista and share your delicious recipe with us. We have launched an online food and cooking encyclopedia ala wikipedia. We also have a small embeddable widget that will help you build traffic from Foodista-related pages. Check it out here. I have to try this one definitely. Brilliant idea using cranberries in Indian cooking. Very delicious....I tried it today and it was really good. My husband loved it. Thanks for sharing. Can we use frozen cranberries? I have not tried frozen ones for this recipe yet. I will update when I try them. I`d appreciate if you let me know in case you tried the frozen cranberries. Is it ok to use dried unsweetened / sweetened cranberries? Will the quantity change if so? I have not tried with the dried Cranberries. If I am then I would use the unsweetened cranberries and in that case soak them for sometime and grind it along with the green chillies. Let me know if you happen to try them. I think I can make an onigiri, riceballs, version of this!